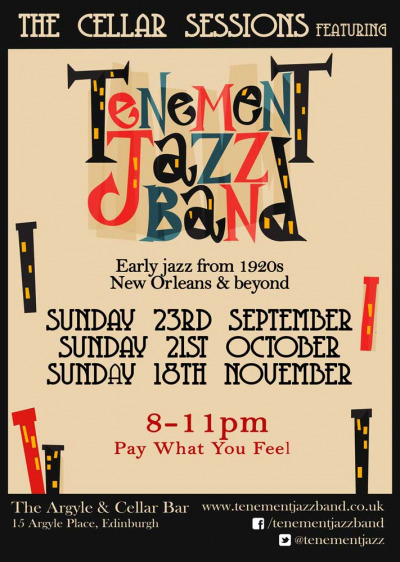 Tenement Jazz band are a traditional jazz band formed in early 2018 in Edinburgh, Scotland. Brought together by their shared love of New Orleans music, and comprising musicians from various corners of Edinburgh’s vibrant jazz scene, they are on a journey of exploration back to the roots of the music that they play. Their aims are to capture the raw energy and excitement of the early jazz recordings, to find and revive lesser-heard songs and cultivate their own interpretations of these, all in order to captivate experienced jazzers, dancing persons, and uninitiated ears alike. Join them for this series of gigs in the intimate confines of the Argyle Bar Cellar; one of Edinburgh's hidden gems, rapidly becoming an integral part of the city vibrant acoustic music scene.